Financial accounting standards in the U.S. are developed by private standard setting organizations (SSOs) that operate under the oversight of a government agency. The primary accounting SSO (FASB) has been criticized for writing too many standards (standards overload), the complexity of its standards, the processes by which its standards are set, and the absence of a competitive mechanism to help set standards. The present study seeks to assess the validity of these concerns by looking at standard setting processes in the broader economy. The study consists of three parts. In Section 1, we present some historical data on standard setting activity and document standards set by 604 private and 80 government SSOs in the U.S. We find that there is a time trend in favour of greater reliance on private rather than government SSOs. Accounting standard setters are late entrants in the field of setting standards and appear to be relatively slow in developing new standards. However, accounting standards are relatively long and complex, thus possibly justifying complaints of standards overload. 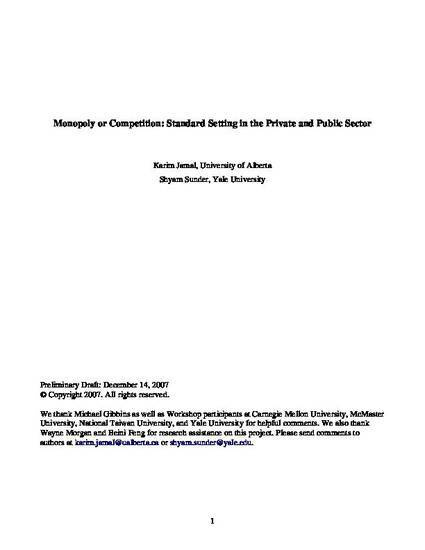 In Section 2, we propose a framework for analysis of the types of standards (quality versus co-ordination) and the processes by which standards are set (monopoly versus competition). We present some data on how standards are set by Government SSOs and provide a detailed comparison of the standard setting processes of four competing technology oriented SSOs relative to the FASB. The comparison highlights a number of features where the FASB differs from other SSOs. These include: the use of sanctions, the threshold of agreement required for standards adoption, and standards competition. In Section 3, we provide data on standards competition in the economy. This includes a case study of internet telephony where competing SSOs have fundamentally transformed the telecommunications industry. Implications for accounting standard setting are discussed.